The strange shape of the Kanto League Division 2 developed further on Sunday, as FC Machida Zelvia stretched their lead to a remarkable eight points after onle five matches following a 2-0 win at Furukawa Electrics Chiba. 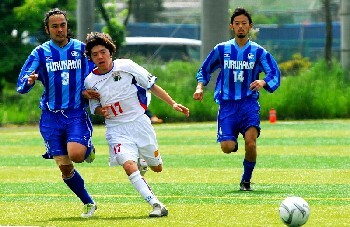 Kanagawa Teachers move second on goal difference as they beat an Aries FC side in danger of a second successive relegation. All Kamisu SC achieved their first win of the season in fine style at Ome FC, but Hitachi Tochigi Uva and Nirasaki Astros remain mid-table after a draw that does neither side any favours. Yaita SC and YSCC both continued their surprise starts to the Kanto League Division 1 season on Sunday to occupy the top two positions. Promoted side Hanno Bruder were the latest team to lose to the reinvigorated Yaita, who are three points clear of YSCC - winners at Toshiba Fuchu. 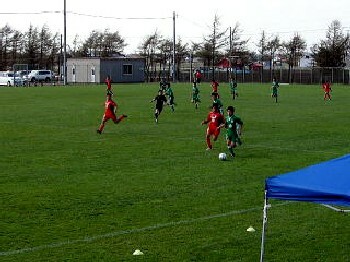 Title holders Luminozo Sayama continued their attempts to get 2006 back on track with a 3-1 win over Toho Titanium, while Saitama SC put four past bottom place MSDF Atsugi Marcus. A single goal for Technonet Osaka was enough to defeat Kobe FC Senior C in one of the two Kansai League Division 2 fixtures on Sunday, taking Technonet back to within a point of leaders FC Kyoto BAMB 1993 - while rooting Kobe FC to the foot of the table. 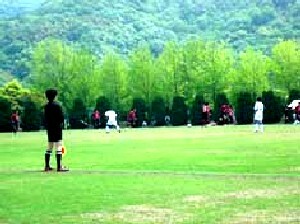 Hermano Osaka meanwhile move into third after a 3-0 win at Kohga School. Banditonce Kobe tightened their grip on Division 1 of the Kansai League with their sixth straight win of the season on Sunday, Ain Food their latest victims. A full six points behind them are nearest challengers FC Mi-o Biwako Kusatsu and Kobe FC 1970, narrow victors over Sanyo Electric Sumoto and Kyoto Shiko Club respectively. 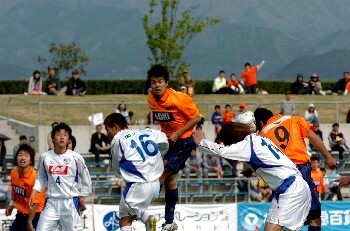 Strugglers Takada FC got a useful point in a 3-3 draw at AS Laranja Kyoto. In the Hokushinetsu League Division 2 derby match on Sunday, Valiente Toyama went to the top of the table as a result of their 2-1 win over Toyama Shinjo Club. 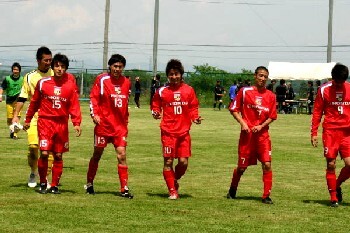 Maruoka Phoenix follow them just a point behind in a very tight division, having beaten previous leaders FC Kanazu. Relegated side FC Antelope have pulled themselves back into contention after their win over TOP Niigata, and draw specialists LionPower Komatsu could only manage another tie with winless Nissei Resin. Hokushinetsu League Division 1 leaders Japan Soccer College may have delivered the death knell to Zweigen Kanazawa's hopes of achieving a JFL place at the end of the season. The students beat last year's Kanazawa SC 1-0 in Sunday's round 5 key fixture to stay top of the division, while Zweigen have now lost two crucial encounters this season, having previously gone down to Matsumoto Yamaga Club. Matsumoto remain level on points with JSC after a 2-0 defeat of Teihens FC and last year's champions Nagano Elsa are just a point off the pace after beating Fervorosa 3-1. At the foot of the table, Ueda Gentian and Niigata University of Management picked up their first point of the season apiece as they drew 1-1. 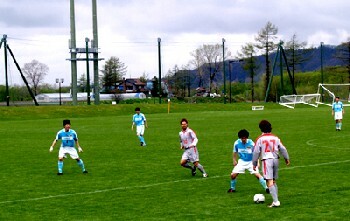 Reigning champions Norbritz Hokkaido threw down the gauntlet to any potential challengers in the first round of the 2006 Hokkaido League, crushing ACSC Asahikawa 7-0. Somewhat ominously for those fans hoping for a more competitive league this year, 2005 runners up Blackpecker Hakodate went down 4-1 at Sapporo Football Group. New club Tokachi Fairsky - a relaunch of promoted side Rude Boys, based in Obihiro - managed a good 1-0 win over Barefoot Hokkaido, and Thank FC were held to a draw by Toyota Motors Hokkaido in the other match. FC Central Chugoku moved to the top of the Chugoku League three rounds in, with a single second half goal enough to give them a vital win at Hiroshima Fujita SC. The other potential challengers remain in touch, as Fagiano Okayama recovered from their crushing defeat last week by FC Central to put seven past Iwami SC, while Sagawa Kyubin Chugoku picked up two points as they won the penalty shoot-out after struggling to a draw against JFE Steel. 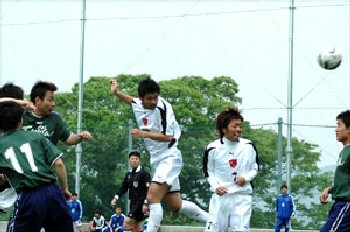 In the other match, new side Renofa Yamaguchi claimed their first win at Hitachi Manufacturing Kasado to move off the bottom of the table.